With full HD 1080P resolution, The ONE Dot is the perfect Wi-Fi surveillance camera for indoor use. Whether you need coverage for the family room or want to use the camera as a baby monitor, the ONE Dot has you covered at all times. Enhanced IR night vision up to 25ft ensures the clarity of your view even in the dark. Plus, built-in 2-way audio lets you communicate with anyone near the camera, from wherever you are. With the LaView ONE app, you’ll be able to view your real time footage, receive motion detection alerts and communicate on-the-go, 24/7. Connect with Wi-Fi, record and store with the Cloud and never miss an important moment with the ONE Dot. HD 1080P with 115° wide-angle coverage. Enhanced IR night vision up to 25ft. Built-in 2-way audio for easy remote communication. Securely store your recordings with encrypted Cloud storage, onboard microSD up to 128GB (microSD card not included) or connect to a LaView NVR. Simply plug into power and connect to Wi-Fi and you’re ready to record. Mount with magnetic base or set on a flat surface for easy placement. HD 1080P + 2-WAY AUDIO – This Wi-Fi IP camera comes equipped with full HD 1080P recording and a 115° wide-angle lens to ensure you capture important moments, 24/7, with clear picture quality. Built-in 2-way audio allows you to communicate in real-time from wherever you are. Both audio and video capabilities transmit from any location via 2.4GHz Wi-Fi connection. ENHANCED IR NIGHT VISION – IR Night Vision provides an enhanced view up to 25ft in the dark. The optimized IR sensor automatically activates in low light conditions to ensure clarity in your picture quality. This guarantees sharpness in the fine details no matter when you view your real-time footage or recordings. MOBILE ALERTS – Motion detection alerts you to movement in your camera’s field of view with push notifications sent directly to your mobile device. This keeps you connected to your live stream anytime, anywhere. Record continuously or only when motion is detected to optimize your storage capacity. MULTIPLE STORAGE OPTIONS – Cloud Storage provides safe and secure storage for all your important data. You’ll be able to access your recordings from anywhere with a reliable Wi-Fi connection. This gives you full control over your security to view your Wi-Fi camera’s footage from wherever you are. A microSD slot supports up to 128GB (microSD card not included) for extra storage directly on the camera. 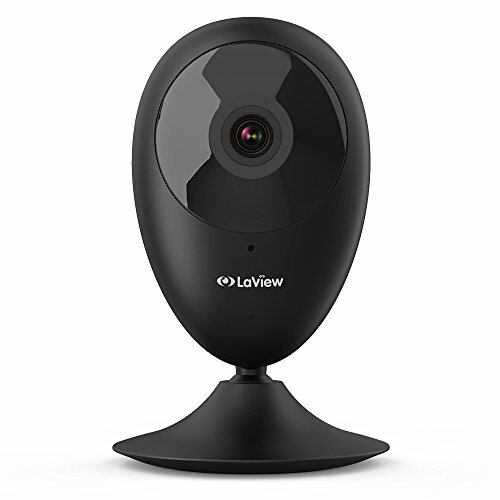 MOBILE VIEW ON-THE-GO – The LaView ONE App bridges the gap between you and your Wi-Fi security camera. It acts as your all-in-one control center for your camera’s settings and storage. With quick and secure access to your Cloud storage data and instant viewing of your live stream footage, you will stay connected to your home 24/7.